A small-ship cruise holiday is a wonderful way to truly get to know a destination, offering everything from specialist port talks that provide all the information you need about each port of call, to guest lecturers who can share their expert knowledge on each destination’s unique art, architecture and natural world. You’ll get to sample all the finest local cuisine, take part in artisan workshops that cover everything from glassblowing to lace making and you’ll enjoy all the conveniences only a cruise holiday can offer, such as unpacking only once and waking up each morning in an exciting new destination. Take a relaxed journey along Europe’s longest river from Moscow to St Petersburg, stopping along the way to soak up the highlights of western Russia. From photographing the distinctive, candy-coloured domes of St Basil’s Cathedral overlooking Red Square to sharing stories and drinking tea at the kitchen table of a local family in the historic riverside town of Uglich; from sampling delicate Russian caviar atop blini pancakes to steaming yourself in a traditional banya, every stop is a unique opportunity to experience the real Russia. 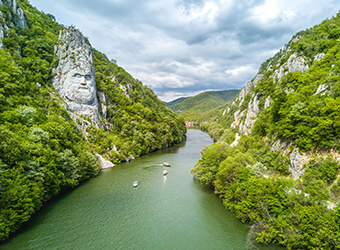 The Danube is Europe’s second-longest river, and although it’s already well on its way eastward to its ultimate destination of the Black Sea when it passes through Budapest, there are plenty of treasures to enjoy through the remaining miles. Marvel at the display of daring horsemanship in Hungary’s Puszta plains region, soak up the dramatic scenery of Serbia’s Iron Gate gorge and try your hand at baking delicious, cheesy banitsa bread in the picturesque Bulgarian port town of Vidin. From the tranquil waters of the Baltic to the beautiful waterfront cities of St Petersburg, Stockholm and Tallinn, the legendary homelands of the Vikings have plenty to keep you entranced. Whether you’re roaming the cobblestoned streets of Porvoo in Finland or the extravagant gardens of Russia’s Peterhof Palace, sampling a glass of gold-flecked Goldwasser in Poland or freshly-caught king crab in Norway, you’ll end your journey with a little bit of Viking in your blood. Ask your personal travel manager for further information on these and other European cruise holidays today.